Friday I was able to sneak off with my good friend Jeff and fish for steelhead on the John Day River. Jeff had never been to the John Day before and I have only spent two days fishing it as part of my steelhead marathon week. The weather was supposed to turn cold, but iced up guides just makes it feel more like steelhead fishing . . . right? Thursday night I was busy trying to make a few less voids in my fly box and forgot to check the flows. Oops, that is just sloppy steelhead fishing. Granted, I was going fishing for steelhead come hell or high water, but it is good to be prepared. When we arrived at the John Day it looked substantially higher, faster, and dirtier than my last trip. It certainly wasn’t hell, but it was kind of high water. Checking the flows once I got home I found the John Day to be a little over 1,000 cfs. That is about twice the flow from my last trip. We waded the river where it was easy a few weeks earlier, but as I dug my feet into the gravel beds to push against the current I began to wonder to myself what the maximum wadeable flow was. I also began to wonder how much farther up my waders the water was going to come before I got to the other side. We made it across, but I don’t think I would want to wade it much past the 1,000 cfs range. If nothing else, fly fishing is seeking answers to questions. The seeking comes in the form of questions. What kind of water lies in the bottom of that canyon? What is the water like around the next bend? Where are the fish? What are the fish biting on? What times of day is the fishing best? And so on and so on. When you get to know a river, you don’t always have to ask. You simply place your flies where you know the fish will be. It is not until the fish are not there or you are on unfamiliar water that you have to ask again. But the John Day is new to me and today my second question after what was the maximum wadeable flow was “If the river doubles in flow will the fish hold farther down the run?” It sounded reasonable if the fish are simply holding in a run with no real structure such as big rocks to sit behind. I did not answer my question and we began to fish the sections of water that held fish on my last visit. We practiced our fly fishing techniques in several sections of water before deciding to take a break on the riverbank and eat some lunch. Jeff was lamenting the distance he had to rollcast to get his flies where he wanted when another fly fisherman walked down the river. He had also been practicing fishing, but he had a much bigger rod to practice with. To be precise, he had a 14’ long rod. I had never seen a 14’ rod before and . . . well it looked like a 14 foot long rod. It was big. 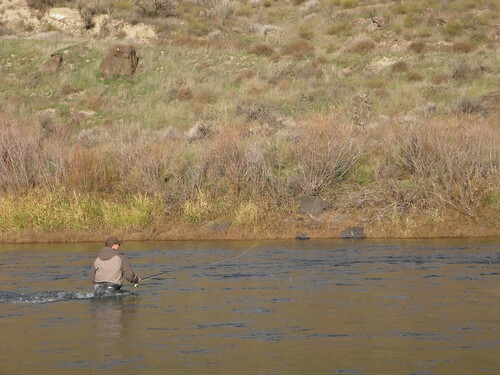 The other angler was on his second trip to the John Day and hadn’t yet hooked up with a John Day steelhead. He communicated to us that everyone had told him to fish the lower end of runs where the water is nearly glass smooth. We joked with him that people had told him that to keep him out of the good water. But after he left I began thinking about my second question. The run we had taken a break by was an excellent looking piece of water and we fished it thoroughly without success. At this point we were several miles upriver and with the short winter days we thought we had better fish our way downstream. On this particular run I had stopped down in the really smooth water, but I began thinking about my second question again and what others had told the other angler. I worked my flies out and began fishing again where I had left off. I was not fishing the water thoroughly though. I was fishing it fast. Jeff was down the river ahead of me when my fly line stopped and I set the hook. “Fish On!” I hollered at Jeff. Maybe those guys weren’t giving him a hard time. And maybe the fish do hold farther down the run when the river doubles in flow. After landing a beautiful wild John Day steelhead, I moved back upstream to fish a little more thoroughly and let Jeff start where I had stopped. After working my way downstream a little, I could see just ever so slight of a riffle in the water quite a distance out. There was a big rock out there, so I pushed my rollcast as far as I could and swung my flies in front and beside the big boulder. Ah . . . nothing like the pull of a second steelhead after catching nothing all day. 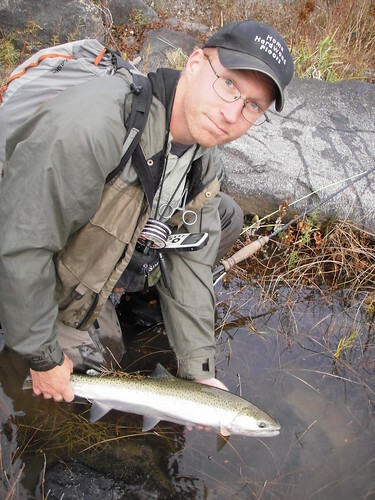 Answers are always nice, especially when they come in the form of bright steelhead that jump out of the water several times. This entry was posted in John Day River. Bookmark the permalink.